Last year’s flu knocked me off my feet. It was the second worst flu I’ve ever had. The only foods I could keep down were fruit and nuts and I ended up losing a pound a week (I guess that’s the upside of a virus!). My muscles were so weak, that my knees would buckle upon standing; I had to grab onto something to prevent falling to the ground. This year I’m seriously considering getting the flu shot (this would be the first time) because I don’t want to be out of commission like last year. Multiple-use flu vaccines contain thimerosol, which is a mercury-based preservative used to stabilize the vaccine and to prevent bacteria growth. Mercury is a toxic metal, but this small amount is not supposed to be harmful. There are single-use flu vaccines that do not contain thimerosol. These are sealed, and only used once so there’s little to no risk of contamination. The flu spray does not contain thimerosol, but it is a live, although weakened, virus so you can get contract the flu from the spray. Those that are pregnant, are diabetic or have asthma are advised not to get the flu spray since it contains a live virus and because these individuals typically have a compromised immune system. Since a new, clean needle is used for each person, there is no risk of contamination from someone else in regards to the multiple-use vaccines. The vials have a rubber stopper and needles are used to draw in the substance. The virus is dead so you cannot get the flu from the influenza vaccine. Some people think they caught the flu from the flu shot, but it takes about two weeks for your antibodies to protect you. If you get the flu, even after receiving the flu shot, the reasons you still got sick could be that you were exposed to the flu before you were inoculated, you caught a different flu strain, or you caught the flu before the antibodies could protect you. Vaccines, just like foods and prescription drugs can have serious side effects in some people. Sometimes the risk of getting vaccines is safer than getting sick. It may depend on your risk factor. It’s not always a simple yes or no answer so you’ll have to make that determination. The flu shot can trigger the onset of Guillain-Barre Syndrome (GBS), which is a painful illness that can cause paralysis and death. There is no cure for Guillain-Barre Syndrome, only treatments. To test for Guillain-Barre Syndrome, spinal fluid would need to be withdrawn and sent to a lab. Spinal fluid withdrawal can cause headaches up to a weak, back pain, and brain bleeding. Yikes! A blood test can be performed to look for an antibodies such as one called GQ1b, although this test doesn’t seem to be common. Even if you don’t have GBS, you may not be in the clear: An article from the US National Library of Medicine National Institutes of Health states that “it is biologically plausible that immunizations may be associated with subsequent GBS… the benefit of vaccines in preventing disease and decreasing morbidity and mortality, particularly for influenza, needs to be weighed against the potential risk of GBS” (1). The CDC concurs, “On very rare occasions, they (people) may develop GBS in the days or weeks after getting a vaccination. Anyone can develop GBS; however, it is more common among older adults. The incidence of GBS increases with age, and people older than 50 years are at greatest risk for developing GBS.”(2). The NY Times articled dated September, 23, 2013 disagrees that GBS is caused by vaccines: “…the swine flu and the regular flu vaccines used today have not resulted in more cases of the illness.” This information was obtained by a 12-year study listed in the Oxford Journals abstract titled: “Lack of Association of Guillain-Barré Syndrome With Vaccinations.” Their conclusion: “In this large retrospective study, we did not find evidence of an increased risk of GBS following vaccinations of any kind, including influenza vaccination.” Even though that’s quite a long study, it’s still one study. My theory: it’s a risk. I know I’m going to get the flu since I get it every year, but I don’t know if the flu shot’s effects on my system will be worse than that of contracting the actual bug. 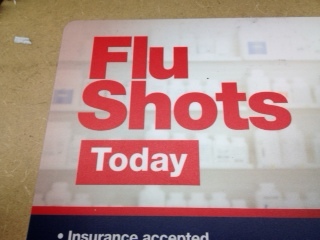 If you are sick, allergic to eggs, or have GBS, don’t get the flu vaccine in any form. For more information, contact your doctor, CDC or go to www.flu.gov. “Vaccines and Guillain-Barré syndrome” Complete article found at: http://www.ncbi.nlm.nih.gov/pubmed/19388722 US National Library of Medicine National Institutes of Health).